"We loved this place. A cabin in the jungle with a veranda and rocking chair (no TV, no AC). Cabins well spaced so we felt immersed in the jungle. Food surprisingly good for all inclusive." "The setting was lovely and the accommodation was good although basic. It was a shame there was no hot water to the basin in the en-suite, but only to the shower as with the mirror over the basin it made shaving a bit of a challenge!" "A lovely environment to be in and good setting. Accommodation very unique and great for sound of wildlife all around. Food OK. Guide very good. Excursions very enjoyable. Our guide added in for free a short trip at night to see frogs which we did. Would recommend. " "Fantastic, set in the middle of the national park . We felt close to nature but well looked after. Loved it "
"The setting was lovely and we felt it compared well with one of its sister hotels which looked rather large and less relaxed . The food was average and self service and did not compare with some of the later hotels . The numbers on the boat trip to explore the nature of the region were at a maximum . This did not affect us too much at the front of the boat but there was some irritation by those nearer the back . The Walk was at another of their hotels and had far too many people on it and was not very informative . Likewise the trip to the Tortaguera town as something or nothing .Obviously it would be different during the turtle season . If I was advising anyone in the future I would suggest look for smaller personalised boat trips to see the nature and scenery of the waterways , a better venue for a walk and more boat nature trips rather than the Tortaguera town trip "
"Shame they failed to collect us from the airstrip - luckily the man from Sansa airlines gave us a lift in his boat so we were not left alone on the concrete airstrip. We passed the boat from Evergreen when we were halfway to the lodge." "Lovely location, excellent room, quiet. Nice pool area and gardens. Buffet style meals were adequate. Staff helpful and friendly." "Beautiful grounds and boat trips kick off a fabulous holiday. Cheeky monkeys stealing food off the table at the riverside restaurant. All travel by boats so saw birds along the way. " "Arriving much earlier than the rest of the group (we had flown down from San Jose rather than take the road), we benefitted from good personal service. Thank you. Trips were well organised and it was a good introduction to our holiday. " "Good setting, but mediocre food, and sometimes an effort to get a drink with one's meal. Room was dingy. " "This was a lodge with basic facilities, the restaurant was 'canteen' style. The pool had disco music which was not our idea of a 'jungle lodge'. In the 3 days, we had three short 'wildlife' excursions which included a village walk and a walk through the grounds of another lodge. the experience was not worth the time, distance and effort getting there. I would not recommend it." "This is a big hotel, rooms pretty basic. Caters to large group tours - you are seated at tables with other people which was unexpected - fine for a couple of nights but we wouldn’t have chosen to holiday that way. Nice swimming pool. Included trips were pretty dull. We skipped the boat trip - others said it was average, not much to see. We did the walking tour which turned out to be a walk through the hotel grounds of sister hotel to evergreen. Very little to see. The guide Elle did his best with a 1k walk and a very large group. We skipped the village visit too and others said it was pretty dull. Getting to Tortuguero takes a long time and we didn’t think it was worth the effort - the canals were nice but others places on our trips offered more to do and better experiences. " "Big individual lodges set right amongst the trees, birds and monkeys. We heard and saw many types of wildlife just walking to breakfast. Well maintained clean pool. Food was OK, but a limited choice. " "Idyllic setting surrounded by the forest and waking to the sound of birds and monkeys"
"Comfortable, we felt we were being processed through our time there with all activities having to fit into a time slot but realise this is probably inevitable. A bit more flexibility and choice would have been appreciated. We loved the environment and setting of the Lodge." "Fantastic tropical jungle location.. the wild Capuchin monkeys were a bit too friendly and the Howler monkeys very noisy!" 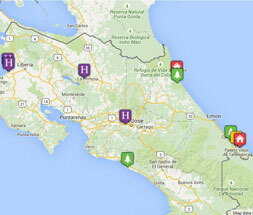 "An excellent introduction to wildlife viewings of Costa Rica with an enthusiastic resident guide. Good food and service." "Room fine, but food mediocre, and didn't like the very regimented insistance on mealtimes and who we sat with. At least flexibility re seating would have been good. " "Although the accommodation was spartan, we enjoyed the feeling of closeness to the rainforest: seeing and hearing the animals and birds around us. The bar over the canalway was a great place to watch wildlife and see the sunset. " "Great location, once we had got over the feeling of being cattle herded around to get us here. Worth going through for the experience and the wildlife in the gardens was amazing. " "Loved the journey by boat to the lodge and the water-based tours. Very comfortable accommodation and good food. Found Tortuguera fascinating...a great start to the holiday." "Thumbs up •	Location : Only reachable by boat and a great place to escape to. •	Wildlife : We probably saw just as much wildlife at the lodge as we did on the river trips. Caymans, crocodiles, a whole multitude of different frogs, birds & reptiles and also many white faced capuchin monkeys which are amazing to watch for hours on end. •	Accommodation : No outstanding luxury with the lodges, but it's not needed as they provide everything that is needed for a few nights in the rain forest and the basic style adds to the experience. •	A peaceful & relaxing environment : Falling asleep to the sound of the frog chorus is really relaxing. Haven't slept so well in years. (That is until the Howler monkeys wake up) •	Going that extra mile for their guests : Due to us having an extra night here they went out of their way to provide us with a meal that differed from their set menu so that we wouldn't have the same meal again during the stay. It was very considerate and we really appreciated this nice touch. Thumbs down •	Mealtimes : Wasn't keen on the set meal times, set dining places and the limited menu & quality of the food. This made it feel a bit more like a school trip or a package holiday. (although I do understand why they operate this way.) •	Unnecessary noise : Wasn't keen on the loud techno music coming from the river front bar area on our first evening. The natural sound of the jungle at night would have been far more relaxing and I'd actually have used the bar if this was the case. The solitude offered by this location is one of its biggest assets. " "Again comfortable, super location in the national park. Boat access to trips, and all food on-site. Good variety, reasonable quality. Welcome bordering on the ceremonial ! " "Although quite a large lodge, the layout of the individual, well-designed rooms on stilts gave a feeling of seclusion and being within the rain forest. The food was plentiful and good. The bar seemed very quiet in the evening." "Loved the cabin and especially the flyscreens instead of window panes, not too sure about howler monkeys at 0330 in the morning in the middle of a thunderstorm. Good choice of food and the tours we did from here were excellent." "The lodges in the forest were fantastic with laid on humming birds, butterflies,howler monkeys and colourful frogs. Loved that we could only get there by boat. " "Wonderful experience sleeping in a lodge that you could hear all the wildlife. Approaching by river adds to the experience. Food was ok but bit like a factory being told which restaurant to eat in, where to sit and limited choice. The guides were fantastic however other staff did not speak especially in the restaurant." "Loved staying in the bungalow in the rainforest. Only comment is that meal times were fixed and if you didn’t show up pretty promptly the dining room was deserted and staff were waiting to clear up! This is just a minor niggle and shouldn’t be used to put people off as we had an amazing time! Adored sitting on the veranda in my rocking chair watching the monkeys, lightning, deluge- it was brilliant!" "Transport to and from was a bit like a cattle market! A brilliant experience non the less." "Good basic lodge, felt a bit like lemmings being carted around"
"Hotel was very nice, but given where we were, Tortugero, which is one of the key Wildlife spots in Costa Rica I did feel that they failed to leverage the maximum opportunity to take guests on boat safaris, they were very keen to up sell additional tours though. The included hike in the jungle was a very disappointing 50 minute walk round a concrete pth at back of sister hotel. Overall I think there are probably better hotels for eco/wildlife experience in Tortugero, its an amazing place but this hotel felt like mass tourism masquerading as eco tourism. Disappointing but we did see Caimen, Armadillo, Toucan, Basilisk Lizards, Capuchin Monkey, Poison Dart Frog and Green tree frog, just got the feeling we could have seen more if we had been in another lodge." "Amazing wildlife just in the gardens. " "Will meet all your expectations, and the wildlife give a few superb surprises, great place to start our adventure. The road/river trip from San Jose to Evergreen was great. " "Lovely lodges. Staff were helpful and courteous. Unlike some trip adviser comments we enjoyed sitting with people we would not normally meet. The food was basic but plentiful and tasty. The river trips were well planned and really enjoyable. So exciting to be surrounded by such amazing wildlife! Room facilities: comfortable, spacious with a good shower. " "Fun to get to, great to stay in"
"Lovely location in the middle of nowhere. Nice lodgings, food healthy though unexciting. Nice pool." "We loved being in the middle of the jungle and hearing howler monkeys at 4.30am! (With the time difference we were awake anyway!). We quickly became friends with the people who joined us at our table for every meal and some of them were on our excursions too. Juan was not only our guide but also like a holiday rep making sure we were in the right place at the right time. He was excellent, although I think we were lucky as some other people didn’t seem to have as good as an experience as we did with other guides." "Full board Breakfast - Excellent Lunch - Excellent Dinner - Adequate. Superb lodge (Evergreen) lovely setting Tours were enjoyable Pool was very nice." "The rustic feel to the lodges, with mosquito netting instead of glass for windows, really made us feel like we were part of the rainforest - especially listening to the night-time sounds, and the frog visiting our shower! Very nicely presented, with towels folded into swans on arrival. Beautiful gardens, full of amazing wildlife, including monkeys, toucans and blue land crabs. The access by boat was part of the adventure, and the fully inclusive programme of activities was well organised and perfectly paced." "We loved the location of this Lodge! Again, the rooms were quite basic and the lack of glass in windows (necessary for the climate) meant we were often disturbed by inconsiderate people leaving for trips before daylight walking past our window (making more noise than the howler monkeys!) The food was buffet style and self-service doesn't work especially well for me because of my disability. We were pleased that we were given a table for just the two of as as we are quite happy not to have to make small talk! The standard of the food was acceptable, bearing in mind that they are feeding many people in a one hour slot." "Enjoyable and comfortable, with a real rainforest feel. Helpful and enthusiastic guide and resort staff." "It rains most of the time. Great bungalow. The sounds of the jungle at night are amazing"
"We spent three days/2 nights at Evergreen Lodge. There was a tropical storm during our time there, so wet clothes and shoes were the norm with no drying facilities. Communal buffet style dining, and you are allocated your table and dining companions. The hotel grounds are teeming with wildlife and the capuchin monkeys were especially memorable." "Truly amazing experience set in the heart of the forest. Essential to the trip"
"This place is amazing with a lovely location along the waterways and where you feel you are sleeping with the wildlife. " "An amazing and spectacular place. The rooms were fantastic and the beds were comfy enough. The food was great and the staff were lovely and kind. The area and gardens in general were magnificent." "Being in the middle of the jungle was amazing. I have to add that the howler monkeys woke us up a lot but the way we saw it, it was part of the experience. Others might not like it though. " "Comfortable, communal, very busy, far too many people, tours at wrong time of day and overcrowded. Apart from the boat trips, it was rapidly clear that the best way to see birds/animals was to ignore the tours and remain at the lodge and let the wildlife come to you whilst all the visitors were elsewhere!" "Only drawaback was they lost Sallys ice packs. Room was quite a walk from main facilities and in a new block. The walls were very thin and you could hear everything that was said in neighbouring rooms. But very friendly and helpful staff. The detached rooms might be a bit more private. " "Good accommodation. Food rather basic." "I feel a bit mean giving Evergreen Lodge an average because we did have a very good stay there. There is so much to see that Torteguero was certainly a highlight for us. The bungalows were clean and comfortable and it does have 2 swimming pools, so not much to complain about. I suppose it was a bit busier than we would have wanted, more people and therefore noise and the food was rather canteen style. Because we were there 3 nights the meals did get a bit boring. Sadly they did try to rectify that by coming out with specially cooked meals for us but only after we were half-way through eating."